Welcome to our Bourbon Red Turkey site! Scott & Kathy have grown STAR Farm from a dream and now want to share the blessings! Our specialty, Bourbon Red Turkeys available for Fall. We at STAR Farm, Hardyville, Kentucky, would like to thank you for your contribution to preserving this National and Kentucky Heritage. 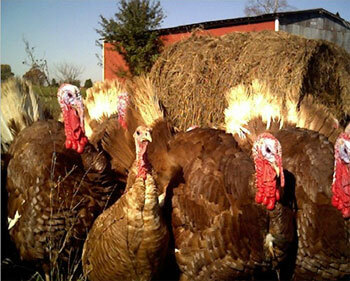 Turkey prices will be $8/lb ranging from 5 to 16 lbs. For ordering, please email me at [email protected]om along with the size turkey you are interested in and I will return email with availability, payment details, etc. Please leave your name, address and call back phone number in your email. NOTE: All turkey sizes are an estimate until exact weight is attained at processing on November 16, 2018. Price adjustments will then be made accordingly. Local pick up will be November 17, 2018 1-3pm behind the Rainbow Blossom Store, 3738 Lexington Road in St. Matthews, Louisville. All shipped orders will go out Monday, November 19, 2018. The Bourbon Red turkey was developed by J.F. Barbee and named for Bourbon County in Kentucky’s Bluegrass Region where it originated in the late 1800’s and ‘Red’ for the rich, chestnut color of the plumage. The Bourbon Red variety was recognized by the American Poultry Association in 1909 and was ambitiously selected and promoted for traits, including a conformation with a heavy breast and richly flavored meat. The Bourbon Red was an important commercial variety through the 1930s and 1940s, however, it declined in popularity as it was unable to compete with the broad breasted varieties. Since 2002, renewed interest in the biological fitness, survivability, and superior flavor of the Bourbon Red has captured consumer interest. This holiday season, thousands of Americans will forgo their normal Large White commercial turkey to enjoy a different kind of bird. “Heritage” turkeys are enjoying a culinary comeback. Thanks to the joint efforts of breed conservationists, farmers and a movement called Slow Food, demand for heritage turkeys is on the increase, although, it is a unique partnership with consumers that is catapulting heritage turkeys to the attention of food lovers nationwide. As one of the only domesticated animals to originate in North America, preservation of the rare heritage turkey breeds is like preserving a historical building or rare document. It’s a piece of American history! All animals raised natural and free range. All turkey and chicken is for sale processed, USDA inspected, all natural and ready to cook. Kathy is Available for Presentations. Kathy speaks about promoting and preserving heritage breeds, and all about bourbon red turkeys. She has spoken at the KY State Fair each year since 2007. Please contact her for more information.